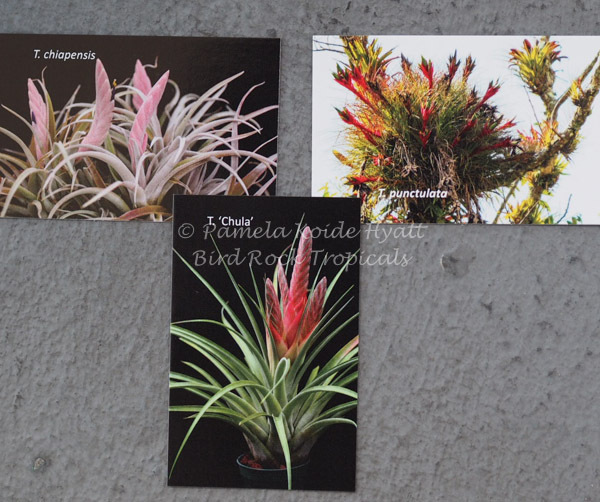 This project started almost two years ago when I made photo display cards for tillandsias. 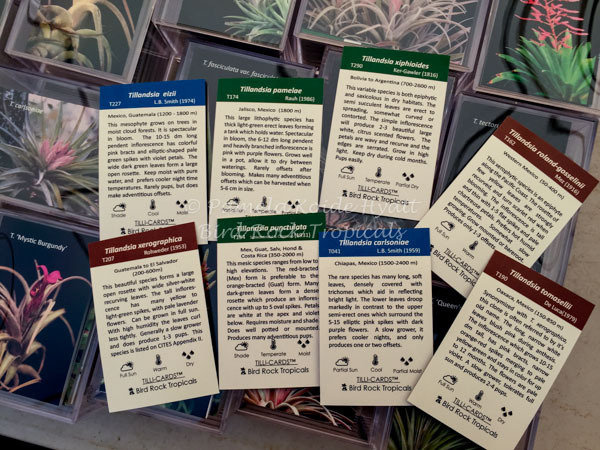 After several people inquired I decided to make informational care cards for tillandsias. My "Beta" (50 cards) was designed to test the size and information offered on the cards. That set was all hybrids, and those who reviewed them requested a mix of species and hybrids. I also felt that more specific information should be included, including elevation and cultural tips to help one determine the best conditions for growing their plants. As a result, I would like to introduce Tilli-Cards, Set 101. Our new set of Tilli-Cards (Set 101) was first released in early September at the WBC in Hawaii. 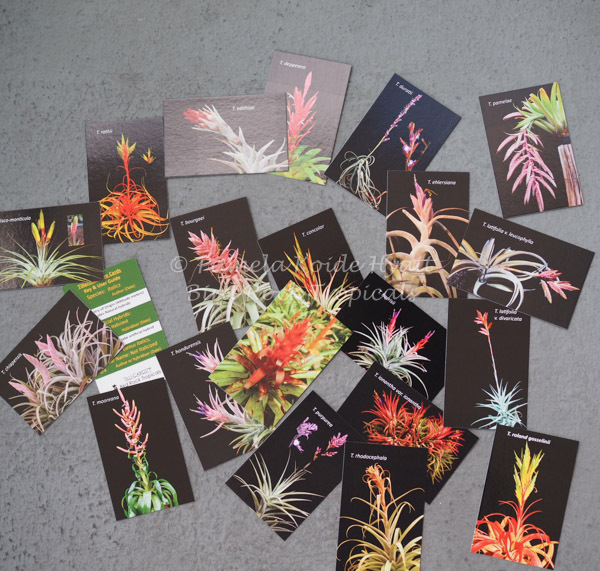 Each set includes a key card and 100 different Tillandsia Care Cards. There are a number of hybrids included, but mostly species. Each card shows when the species was published, by whom, where it grows and what elevation. Hybrid cards show the hybridizer, year registered and details of parentage. If a natural hybrid, it lists putative parents and locality. Cards are color coded by basic type of care instructions-Intermediate, Mesic or Xeric. 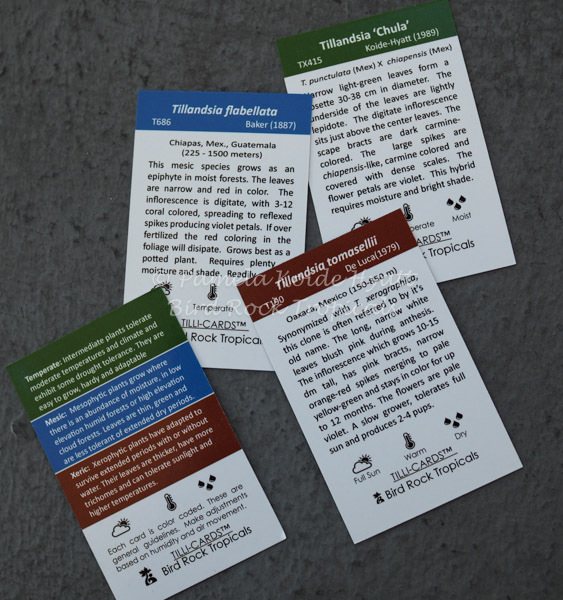 Each card contains a brief description of the plant and tips on growing and cultivating. 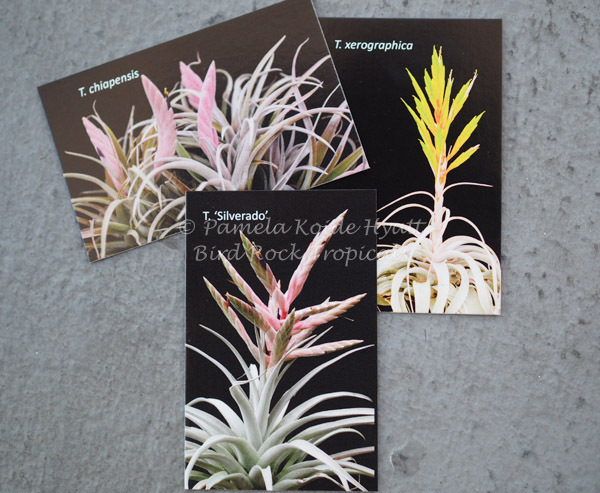 They are designed to help you learn about tillandsias, where they grow and how to take care of them. You can see the results of hybridizing of two species by comparing the species parents with the hybrid card. Tilli-Cards can be placed into business card sleeves for 2 or 3 ring binders. You can organize them in alphabetical order, or numberical order. They can be sorted by culture; mesic, xeric or intermediate. Separate them by species or hybrids, or by those plants that you have and those you want to acquire. 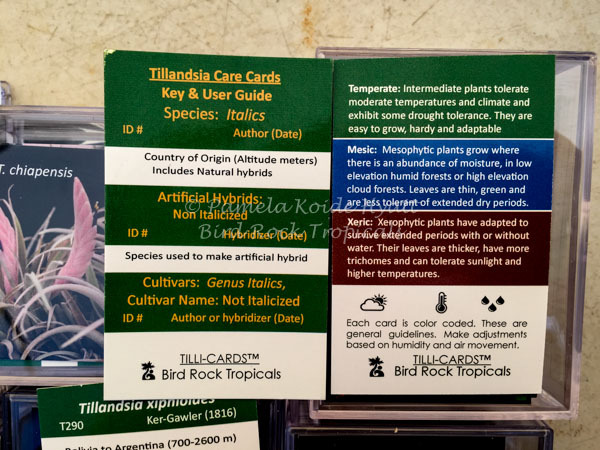 Tilli-Cards﻿﻿ are now available in our TGIF store, (http://blog.birdrocktropicals.com/store/c1/Featured_Products.html).